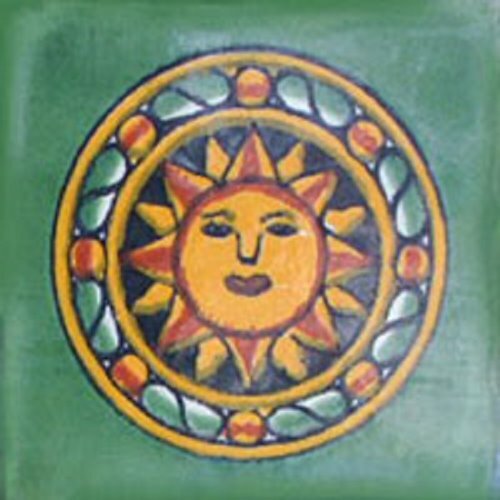 Mexican tiles in "Green Aztec Sun" style. Old Europe with green, yellow and terra cotta clay tile design over white background. Shipping from Mexico to the US and Canada is estimated for four weeks. I was searching for accent tiles for my veranda which has already installed on walls green ceramic tiles. We purchased them while on the trip down South from Canada last winter. After installing our green tiles on the wall we thought there was something missing there and the idea of removing certain tiles and installing in their place accent tiles with sun image was born. Since the field tiles we brought from Mexico earlier and the sun tiles have very similar green background our veranda wall came to live. I love my wall new look.